The McDowell Flyers are an ad hoc group of indoor R/C enthusiasts that meet on Friday evening in the McDowell Intermediate High School Gymnasium. John Schardt is the unofficial point man, so he can answer any questions you have about model restrictions and flight schedules (not all Fridays are available). Melanie and I first visited the gym a couple weeks ago, and were amazed at the number of people there. I'm told a lot are from the local Thermal-G R/C flying club, but many do not have any formal club affiliation. 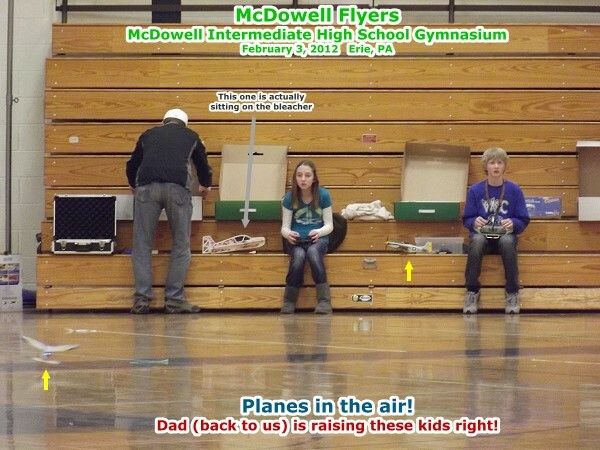 The McDowell Flyers group is not an AMA chartered club. In the video below, you can see the level of activity. With as many as 10 airplanes aloft at one time, it's a wonder there are so few collisions - yes, they do happen, but usually with no damage. It looks like a swarm of bugs on a humid summer night. This is definitely a good way to polish your skills at flying in close quarters with many other planes. Flying weight is limited to 2 ounces in order to keep mid-air collision and contact with school fixture damages to a minimum, preferably to zero. Most of the models are the pre-built, ready-to-fly (RTF) type. From what I've seen, most of the guys (and a few gals) opt for their own transmitters rather than using the el cheapo ones that sometimes come with the airplanes. Occasionally, you'll see a micro helicopter, a flying saucer, or a quadrotor floating around. Many of the airplanes flown are ready-to-fly models by companies like Park Zone and E-flite. Horizon Hobby sells both lines. I've always had great service from Horizon Hobby. Tower Hobbies sells the FlyZone line of micro flyers. I've been buying hobby supplies from Tower Hobbies since they first opened in the early 1970s. Micro helicopters and flying saucers can be found at these two companies as well. Most of these models cost right around $100, and usually include everything you need except the transmitter. You can also by models with a transmitter, but if you are going to stay with the hobby for any length of time, you'll definitely want a "real" transmitter. From I-90, take the 26th Street (Rt. 20) exit heading west. Go about 1 mile and turn right onto Caughey Road. 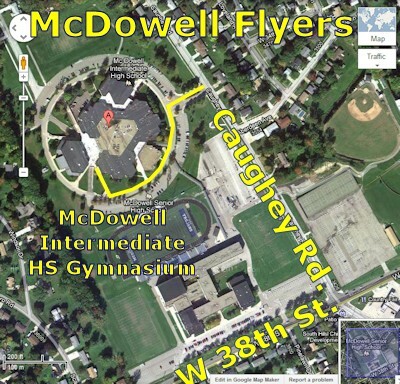 McDowell Middle School is on the right after about a half mile. Turn in and go to the gymnasium entrance.